John, 35, Mike, 31, Joe, 30, and Dan, 27, grew up in Colonie, four of Cathy and Gerald Griner’s six children. They have two sisters. Although Gerald Griner’s primary job was working for the state of New York, he bought and remodeled investment properties on the side. Cathy Griner retired last year after 44 years as the owner of Hansel and Gretel Nursery School in their hometown. The Griner brothers’ grandfather and great-uncle, Tom Papa, also worked in construction-related fields and real estate development. As children, they helped their father and they all worked summers at Classic Sheds, owned by their maternal uncle Tom Ensslin. They swept floors, framed sheds, installed siding, roofing and then made deliveries. As adults, the brothers pursued jobs in the field and worked together on real estate deals. “It was inevitable we would do something together,” John says. The men founded Griner Brothers in 2015. They started slowly, building one house at a time. 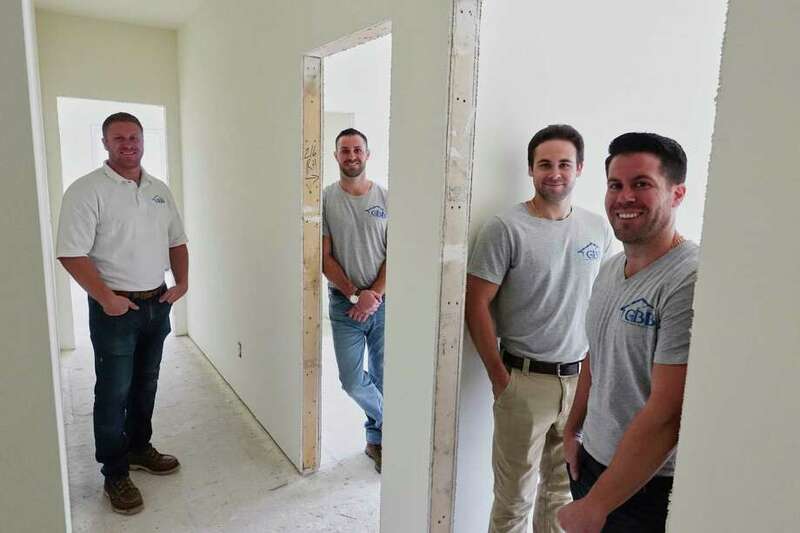 All four kept their day jobs — John owns Mens Inc. barber shop on Central Avenue in Albany, Mike owns Best Refinishing, a bathroom remodeling company and Joe and Dan recently started a home remodeling company together. The men haven’t taken titles. Instead, they follow a workflow according to each brother’s expertise. A project starts with Dan, who meets with clients, the engineer and architect, and arranges for excavation. Mike is the framer, Joe does interior work — drywall and painting — and John is the finish carpenter and installs kitchens and floors. The roles aren’t strict. Each brother can do the others’ jobs. They try to meet at their parents’ house every Sunday for dinner and have a company meeting when they discuss projects and time lines. They’ve borrowed money from family members here and there but finance each home themselves. They spend time on market research to see what buyers are looking for in a new home. “It’s a lot of money to lay out, so we have to be strategic,” Dan says. Currently they have three houses underway, including 4498 Hurst Road in Guilderland, listed at $429,000 by Jamie Mattison of 518 Realty. The house is 1,931 square feet and has an office, three bedrooms and two and a half bathrooms. The brothers are proud of the house — designed by Dan — because it is a not a typical box. It has a unusual footprint designed to be interesting, rather than cookie-cutter. Everything is high quality, John says, from the hardwood to soft-close cabinets, recessed lighting, quartz counters and high ceilings — all included in the list price. It’s a lot of work, and it gives the brothers added respect for their father, who did all the work on his properties by himself, John says. “We build what we would want, what our parents and sisters would want,” John says.